Lilli Wosk is a vocal coach and music director based in New York City. Her studio focuses on book-building and audition prep with a side of vocal technique and not-so-tough love. She splits her coaching time between Washington Heights and Midtown, Manhattan and her clients range from Broadway's best to those who carry tunes in buckets and love to sing anyway! Right now you can find her on stage, conducting the first national Broadway tour of Waitress - so coaching is currently limited to Skype/FaceTime consultations. As a music director, Lilli has worked on the west coast MDing for Transcendence Theatre Company, throughout the US and to Tokyo with the 2013 2nd (Inter)National Tour of HAIR, and has been fortunate to MD in and around NYC with such great companies as the New York Theatre Barn, the Astoria Performing Arts Center, and The Gallery Players. She loves collaborating and teaching with other multi-talented coaches, directors, and composers - check out the Current Projects page for more details and upcoming workshops. As an educator, she has become part of the artistic staff at Berklee College of Music Summer Intensive, NYU's Experimental Theatre Wing, Stage Coach Theatre Arts, Beacon High School, The San Francisco Arts Education Project, and Education Through Music. 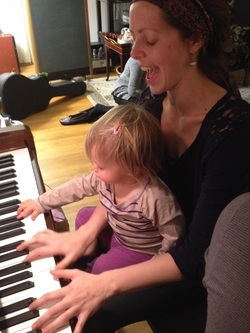 Her teaching style is based on a breathing first, acting second, singing third philosophy. She blends her passion for truth telling with her understanding of singing physiology create a recipe that is right for each unique voice.